Not so much a review as an organised rant. THE WORLD: Shelved as 'science fantasy', The Fifth Season by N.K. 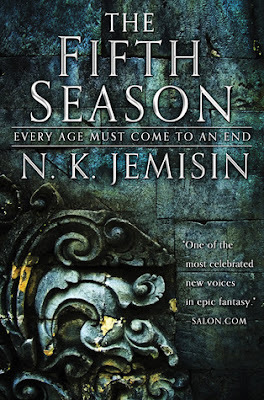 Jemisin is the first installment in the series that is built on the premise that humans have so ravaged the world that Father Earth wants revenge. There is only one continent left now called the Stillness which frequently suffers severe unpredictable climate changes - called the 'fifth season.' Every fifth season wipes out populations and communities. The population is also altered now. Alongside humans are beings called orogenes, who have the ability to harness the power of the earth, feel shifts in stone and hear vibrations of the ground. And to control the orogenes from harming humans, we have the Guardians, who have been charged with taking care of the orogenes. The Stillness is a ravaged world, made savage through its suffering. Not unlike our world, it uses blind violence to get what it wants. THE STORY: The book introduces us to three women, at different points in time. Essun, addressed simply as "you", is the woman of the present day, an orogene who takes us through the latest fifth season that has hit the world. Hiding amongst the humans of a small village, Essun has constructed a lie. She is married and has two children, seemingly happy, except her husband doesn't know that Essun and their children are orogenes. One day, a giant rift hits the ground, signalling the start of yet another Season, and demolishes many communities in the Stillness. But this is not the greatest of Essun's troubles. For the same day, she comes home to find her husband and daughter missing and her little boy strangled to death. And that can only mean one thing: their secret is out. Essun can sense that her daughter is still alive somewhere, a mother's instinct, and she sets out to find her husband and daughter and avenge her son's death. But Father Earth has other plans for Essun. The plot is complicated and the timelines could get confusing. But it will keep on the edge of your seat, that's for sure. The Broken Earth Trilogy is reminiscent of Earthsea in its conspicuous lack of whitewashing. The characters, spread across different communities in the Stillness, are of different race, colour and sexuality - Jemisin takes great care in describing the characters as both individuals and representatives of their creed. And she tackles the prejudices present in the characters carefully as well - giving us a truly well-rounded believable world, not without its faults, but overall, understandably so. Perhaps the biggest achievement for Jemisin is that you cannot characterize any of her characters as inherently 'good' or 'bad'; that kind of black-and-white judgment absent in her writing. Our characters range from prudent and self important, to impulsive and lacking in faith - and they're all simply trying to survive, one way or the other. This is not a moral story, not a preaching session. It's a lot more complicated than that. Any lessons are for you to deduce. "Life cannot exist without the Earth.Yet there is a not-unsubstantiated chance that life will win its war, and destroy the Earth. We’ve come close a few times. That can’t happen. We cannot be permitted to win."